A dozen years ago a new golf book surprised its publisher and many others with its stunning success. Harvey Penick’s Little Red Book, co-authored with Bud Shrake, contained a collection of pithy golf lessons, vignettes about some of Penick’s more famous students such as Tom Kite and Ben Crenshaw, and the occasional bit of philosophizing about the relationship between teaching golf and lessons for life off the golf course. It was a huge hit, which was a bit surprising because Penick was not particularly well-known. He’d been teaching golf in Austin, Texas for decades, but outside the confines of folks deeply involved with the sport he was by no means a household name like Jack Nicklaus or Tiger Woods. In part, I think the book caught on because of its own intrinsic value and the way that Penick’s voice came through to his readers in the slim little volume. He read like he was, a quietly confident, remarkable teacher, who knew how to reach his students and improve their golfing abilities at all skill levels. The similarities go far beyond the fact that the book is the same basic shape and size of Penick’s bestseller, about 175 pages or so that also read quickly. Dye is also well-known to deeply avid golfers, but she does not have nearly the same widely-known reputation outside of golf, such as Annika Sorenstam or Nancy Lopez. Nonetheless, she’s been involved with the sport for many decades, both as an accomplished amateur player and as a golf architect with her husband, Pete Dye. 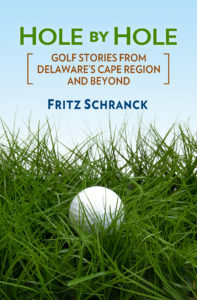 Like Penick’s book, the format of From Birdies to Bunkers is also based on short pieces, varying in length from a few pages to a single paragraph. And as with Little Red Book, Dye’s often witty remembrances take the reader well beyond the sport. The mind’s ear can listen to Dye’s voice as she makes the connections between what she learned in a lifetime of golf and how those lessons applied to the real world. For example, mixed in among the stories about how she and her husband started out in midlife on their architecture business are pieces about how her boys, P.B. and Perry, maintained a veritable menagerie in the Dye household. Somehow I don’t think she could have been successfully accused of being a domestic goddess. Dye also fondly recalls how her father encouraged her to take up the game, and uses those memories to help prove her argument that men will be in the forefront of eliminating the vestiges of illogical discrimination against women. After all, many of us golfing fathers have daughters, too. Among those who follow the history of golf design, Dye is best known for her successful efforts to implement forward tees for women golfers, in lieu of the former practice of simply putting the red tees at the front edge of the men’s box. Dye was instrumental in developing the standards that have helped millions of women enjoy the game. If she had done nothing else related to golf course architecture, her forward tee designs would have been noteworthy enough, but Dye did far more. Perhaps her most famous additional suggestion led to the creation of the island green on the 17th hole at the TPC Course, home of the Players Championship. The on-site flexibility that she and her husband applied to their work resulted in one of the most famous short holes in golf. From my perspective, the most illuminating new information about Dye related to her tournament experience as a national-level amateur golfer in her own right. Dye competed as a young woman when the LPGA was just beginning to find a way to provide a living for professional golfers such as Patty Berg, and she continued to play at a high level when a young golfer named Nancy Lopez took the women’s game to a new level of national prominence. Dye’s own thoughts about competition, preparation, and practice should be useful guidance to young golfers. Dye also discusses her relationship with her husband Pete. How these two found a way to share their mutual love for the game and each other with their joint work in course design and construction was perhaps the most rewarding part of the book. Only time will tell if Alice Dye’s little blue book will become as popular as Harvey Penick’s red one. Nonetheless, her story was well worth telling, and deserves a wide audience.